The Chief Executive Officer (CEO) of the Zoomlion Ghana Limited, Mr Joseph Siaw Agyapong, has denied allegations that the company paid bribes to secure the Emergency Monrovia Urban Sanitation (EMUS) project financed by the World Bank. The Federation of University Senior Staff Associations of Ghana (FUSSAG) has announced the suspension of its 50-day strike action. Scores of taxi drivers in Accra yesterday blocked part of the Accra-Nsawam road to protest what they described as persistent harassment by members of the Traffic Security Task Force of the Accra Metropolitan Assembly (AMA). 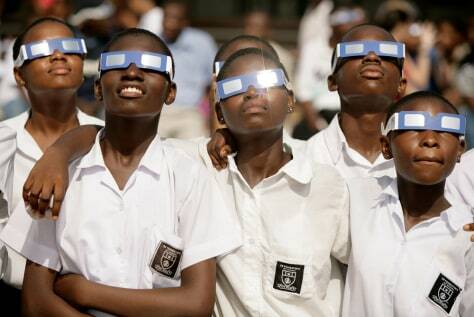 Ghana and other parts of West Africa, will on November 3, 2013, experience a partial hybrid solar eclipse. The management of the Komfo Anokye Teaching Hospital (KATH), in collaboration with the government, has designed a programme intended to improve healthcare delivery and maternal care at its peripheral hospitals to bring down the maternal mortality rate in the country. The First Lady President of the Rotary Club of Kumasi District 9102, Rotarian Mrs Marilyn Owusu, has been inducted into office at a ceremony in Kumasi. MTN Ghana Foundation has distributed 10 incubators and five ventilators at a total cost of GH¢125,000 to 15 selected public health institutions in the country. The police at Offinso have arrested a 32-year-old driver at Sampraso near Offinso in the Ashanti Region, for allegedly beating his wife to death. African scholars attending an international conference in China have described Africa-China relationship as a ‘one-way traffic,’ and urged their leaders to position themselves firmly and strategically, as equal partners, in their dealings with China. Fifty artisans, selected from various workshops, have undergone a one-day sensitisation workshop on co-operatives in Kumasi in the Ashanti Region. The Gender Responsive Skills and Community Development Project (GRSCDP) has presented five laptops to the Ghana Statistical Service (GSS) to assist the institution in developing gender-related statistical data for development planning, monitoring and evaluation. Nimbus Foundation, a non-governmental organisation that seeks to champion the right of women and children through research, advocacy and capacity building, has been launched in Accra. Women continue to play crucial roles in the agricultural sector, but a number of them barriers that hinder them from becoming successful farmers. This includes land acquisition, access to credit and markets and inappropriate use of technologies. The government has directed the Environmental Protection Agency (EPA) to design a performance-based rating system for district assemblies to assess the efficient use of financial resources. A payroll printing site to print pay reports of government employees in the three northern regions has been launched in Tamale by the Controller and Accountant General Department (CAGD). Workers of Bulk oil Storage and Transportation (BOST) Company Ltd. in Tema have embarked on strike over alleged poor management of the company. The Central Regional Health Directorate, has vaccinated a total of 20,007 girls from nine to 11 years against cervical cancer, which is killing many women in the country. The Executive Chairman of Tobinco Pharmaceuticals Ltd and the Director of Bliss GVS Pharma, distributors of anti-malaria suppository, Gsunate Plus, have been invited by the Bureau of National Investigations to assist the Food and Drugs Authority (FDA) in investigations over alleged importation of fake drugs. About 4,000 mine workers are to be retrenched by mining companies because of high operational cost and falling prices of gold on the world market.